ONE: Add the shea butter to a large mixing bowl. 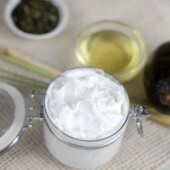 Using a hand blender or stand mixer, whip the butter on medium speed for 1-2 minutes until it’s fluffy and smooth. Periodically scrape the sides of the bowl with a spatula. 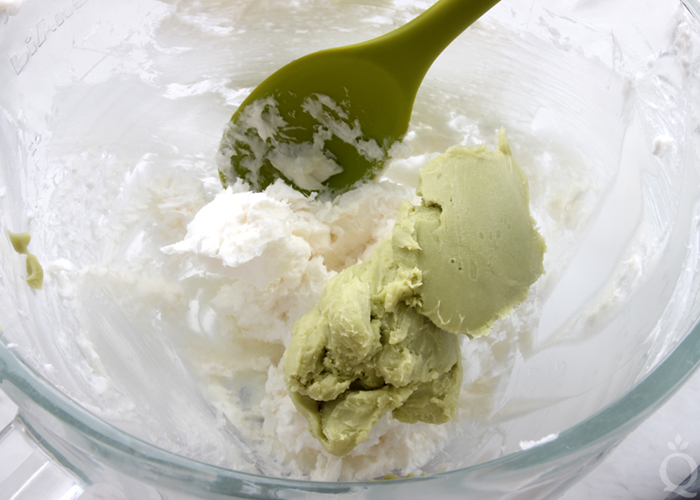 TWO: Add the Matcha Green Tea Butter to the shea butter. 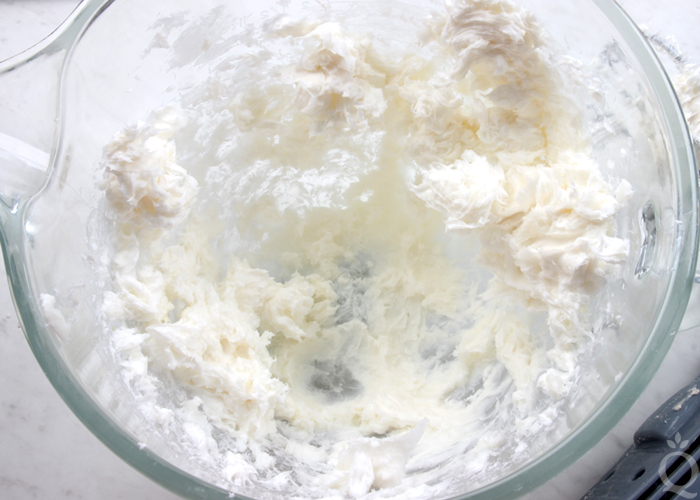 Turn the mixer on medium and whip the two butters together until they’re completely smooth. 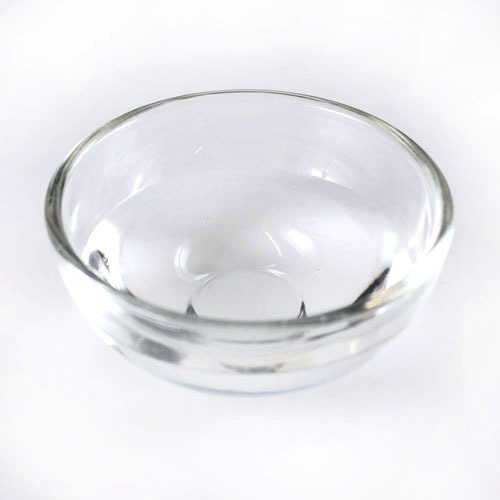 THREE: Add the Matcha Tea Latte Fragrance Oil (and the Optiphen if you’re using it) to the bowl. Turn the hand blender on low so the oil doesn’t splatter out of the bowl and then gradually increase the speed to medium. Whip for another minute, scraping the sides of the bowl with a spatula periodically, until the liquids are fully incorporated. FOUR: Add the arrowroot powder. 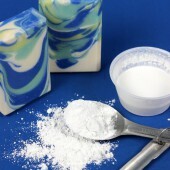 Using a spatula, hand stir the powder until it’s mostly mixed in. 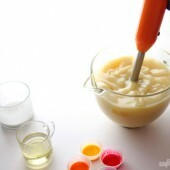 Then mix with the hand blender on low speed, gradually increasing the speed to medium. 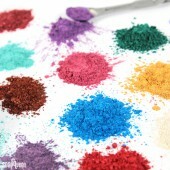 Blend for another 1-2 minutes to fully incorporate all the ingredients. 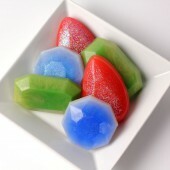 Spoon the butter evenly into jars and enjoy! 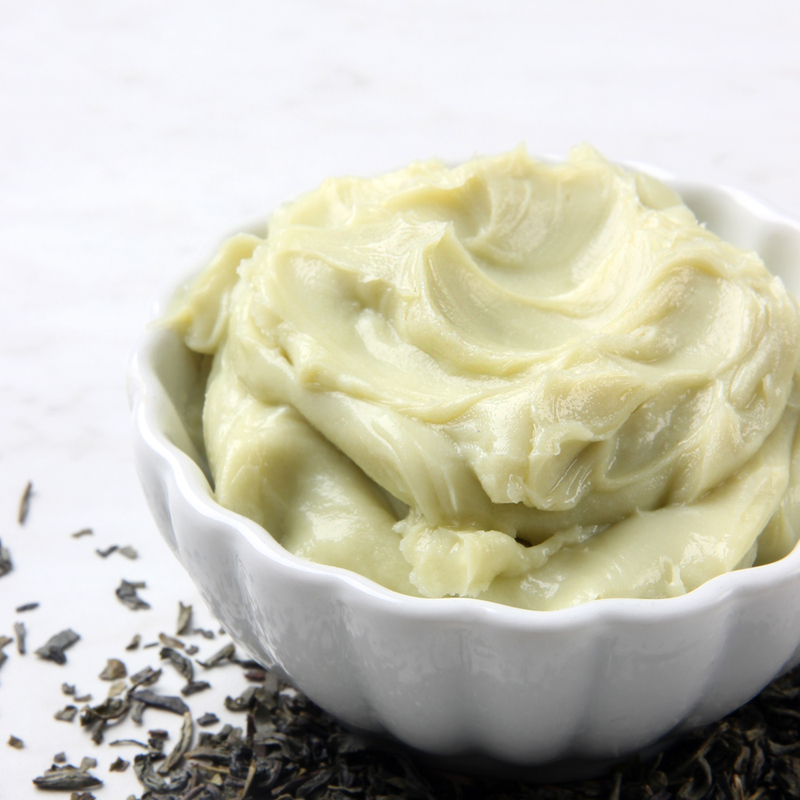 This Matcha Green Tea Body Butter is made with shea butter and matcha green tea butter. Add the shea butter to a large mixing bowl. 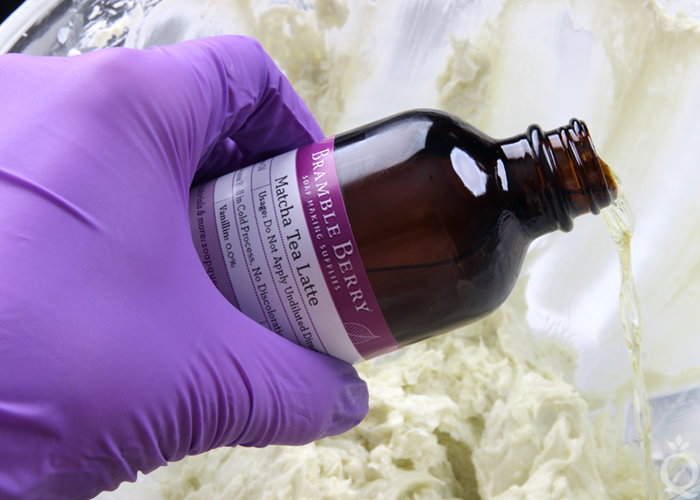 Using a hand blender or stand mixer, whip the butter on medium speed for 1-2 minutes until it’s fluffy and smooth. Periodically scrape the sides of the bowl with a spatula. Add the Matcha Green Tea Butter to the shea butter. 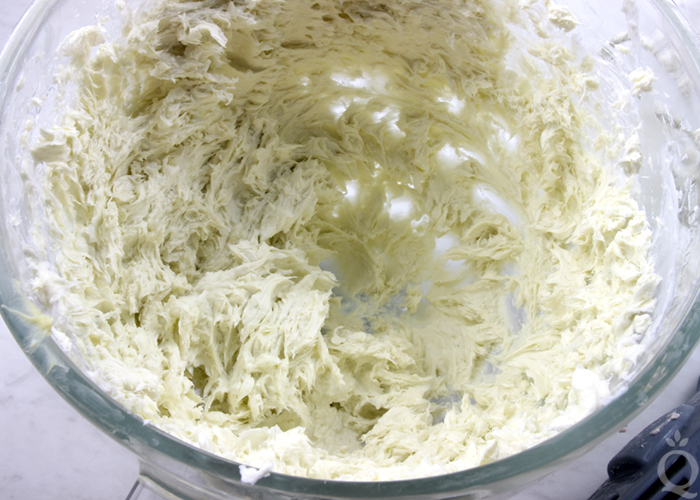 Turn the mixer on medium and whip the two butters together until they’re completely smooth. 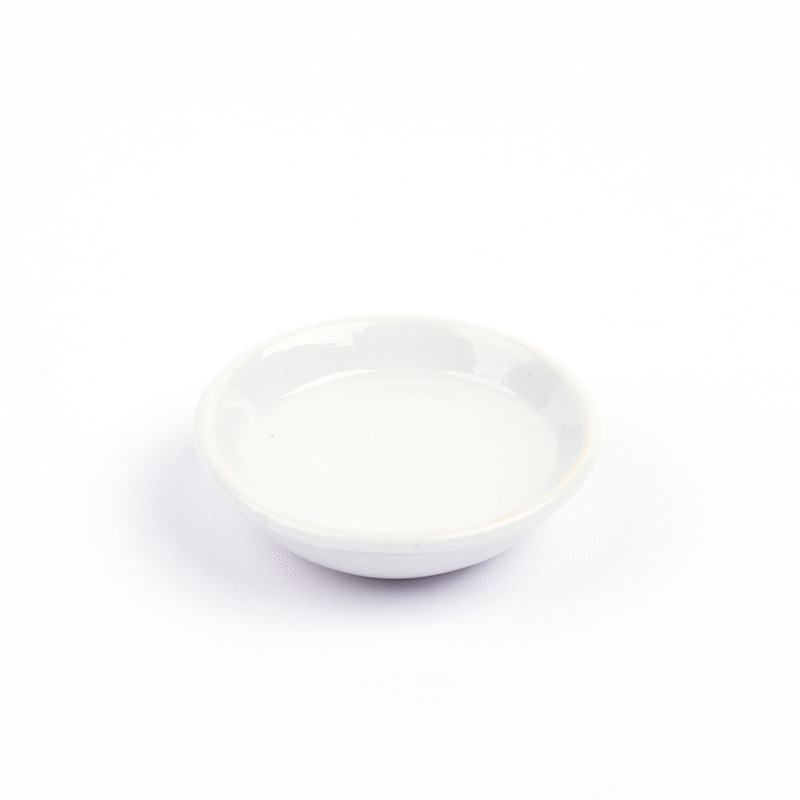 Add the Matcha Tea Latte Fragrance Oil (and the Optiphen if you’re using it) to the bowl. 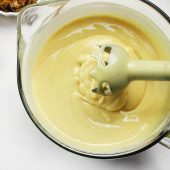 Turn the hand blender on low so the oil doesn’t splatter out of the bowl and then gradually increase the speed to medium. Whip for another minute, scraping the sides of the bowl with a spatula periodically, until the liquids are fully incorporated. Add the arrowroot powder. Using a spatula, hand stir the powder until it’s mostly mixed in. 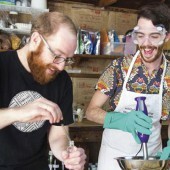 Then mix with the hand blender on low speed, gradually increasing the speed to medium. Blend for another 1-2 minutes to fully incorporate all the ingredients. Spoon the butter evenly into jars and enjoy! I am not sure but there should hopefully be an unsubscribe button on the email you are receiving. If not please let us know! Made this awhile back. Love it. 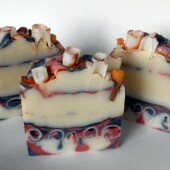 Decided to make again but the matcha green tea latte fragrance oil is no longer available. 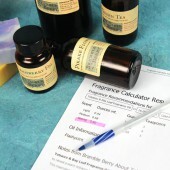 Is there a substitute fragrance oil that you can recommend? 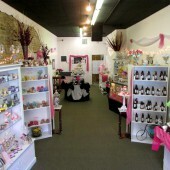 You can really use any fragrance oil you like the smell of! 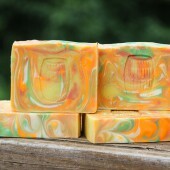 If you are wanting to keep it to a similar scent I would recommend the Green Tea & Cucumber Fragrance Oil. 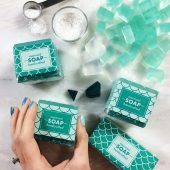 hello fellow soapmakers ! 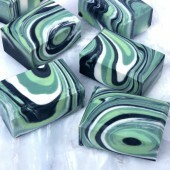 I couldn’t find any entry on the blog about using matcha tea in cold process soap. Has anyone tried this yet with good results? I appreciate your help !! thank you Chloe for your speedy reply. 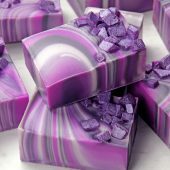 finished the soap a couple of minutes ago and is now in the freezer. Let’s see how it goes. Only thing I do not love right now is the color. Looks like bird poop XD oh well. It’ll be worth it if it feels good on the skin. Thanks for sharing your test Ross! post title that makes people want more? 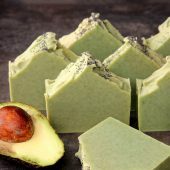 I mean DIY Matcha Green Tea Body Butter – Soap Queen is kinda boring. 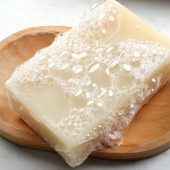 How do I prevent the butter from melting during transit from an online order? 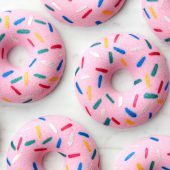 Is there any ingredient i need to add to butter while making it? 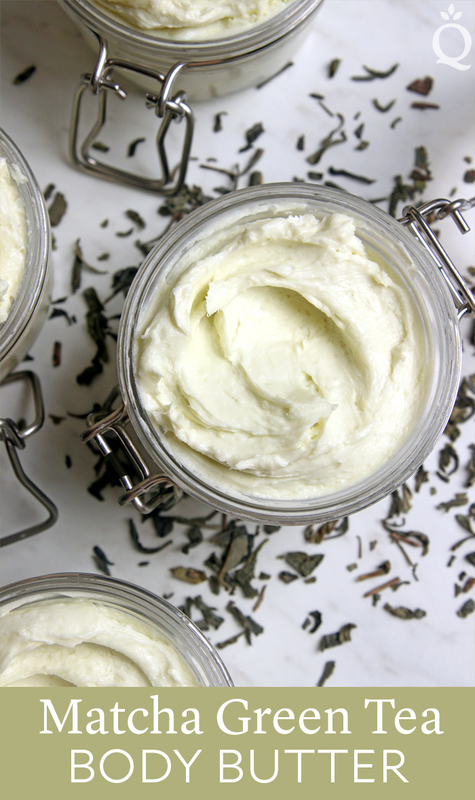 Is your recipe above using refined or unrefined shea butter? 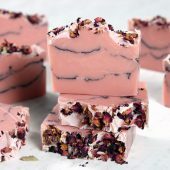 If I do use unrefined, will it smell a little weird if i choose to hide the nutty smell by adding in fragrance/essential oils? 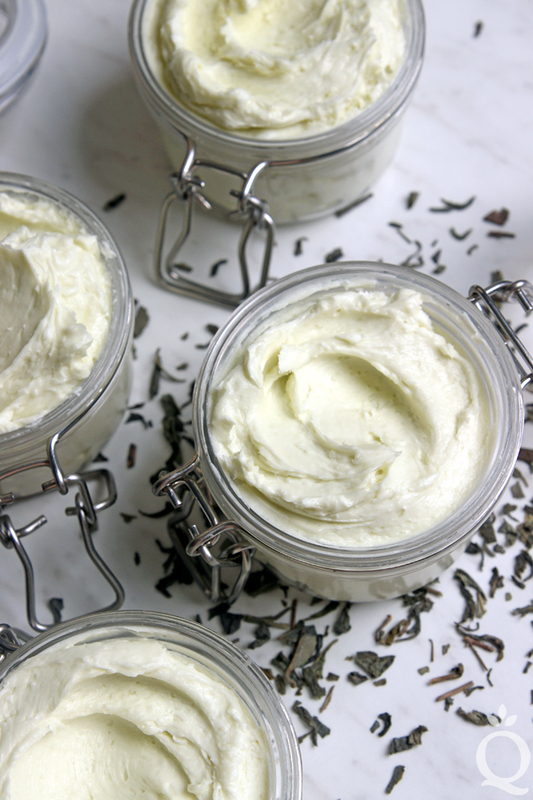 Unrefined shea butter can have a pretty strong scent. 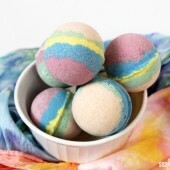 You can try adding fragrance or essential oil to see if that helps. I would recommend a small test batch to see what you think. 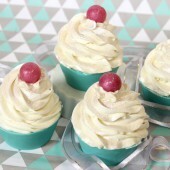 If you’re not a fan, the shea butter from our website works well and doesn’t affect the scent of this recipe. 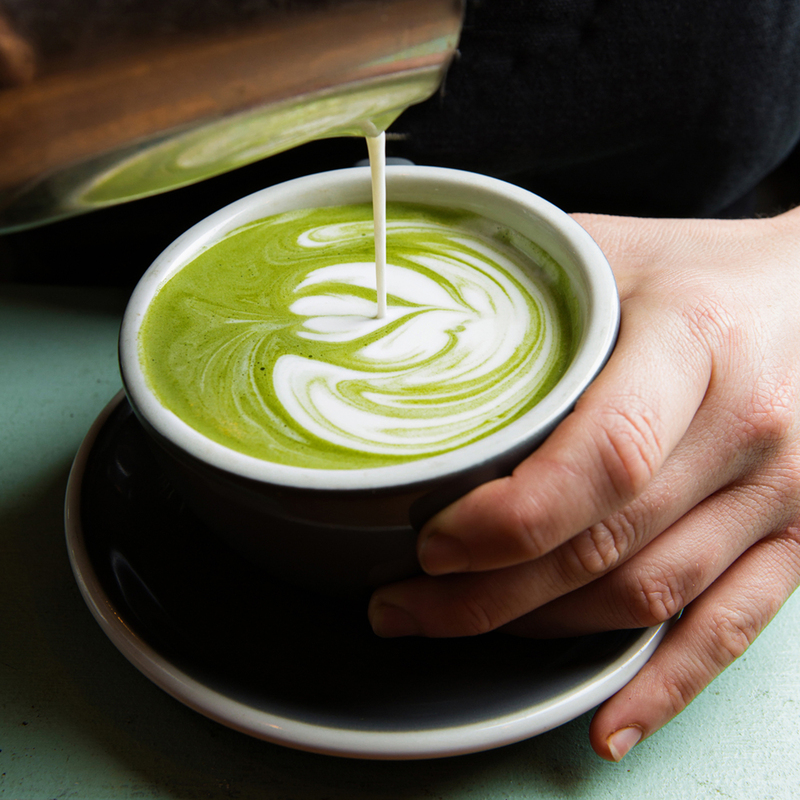 where can I get matcha butter ? You can find it on our website. I just tried this recipe but the finished product is grainy. Please advise on how this could’ve happened. I’m thinking maybe there’s some graininess in the shea butter or maybe the matcha butter but your recipe doesn’t say to heat either. Any ideas on how this can be fixed? 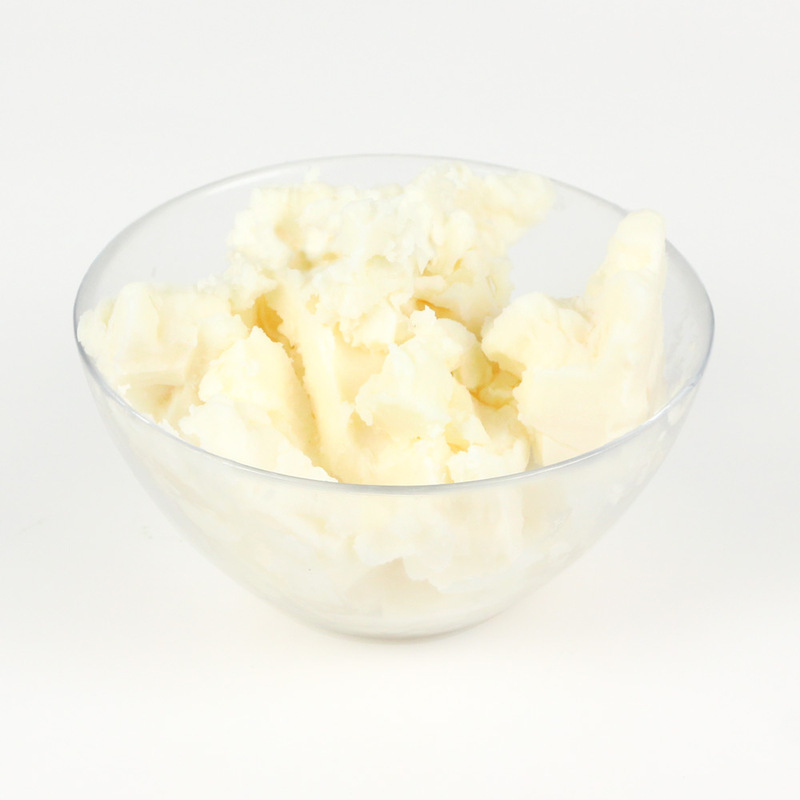 Shea butter is notorious for becoming grainy. It’s possible it was grainy prior to whipping. 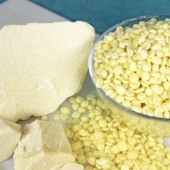 Shea butter contains a variety of fatty acids which melt and cool at different temperatures. When the butter melts and cools down too slowly, it can cause crystallization. To fix this, remelt the butter completely over a double-boiler. 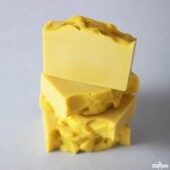 Once the butter is completely melted, pour it into a container and place it in the freezer. A few hours in the freezer will do the trick, you want the butter to cool down quickly and turn solid. If you would like the butter to have a whipped consistency, allow it to return to room temperature and re-whip it. 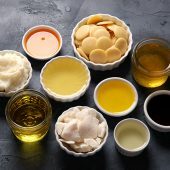 Can you use Vitamin E (mixed tocopherols) as a preservative in this recipe? 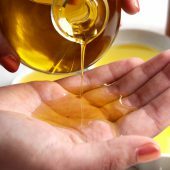 You can add vitamin E oil at 1% of the weight of the recipe to help extend the shelf life of the oils. However, it doesn’t protect against mold and bacteria. For that we’d recommend Phenonip or Optiphen at 1%. What is the shelf life for this product? 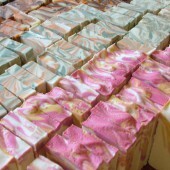 I want to start selling body butters commercially, but afraid that they may spoil / grow mold overtime . This product has a shelf life of about a year. It stores best in a cool, dry place like a cabinet or basement. 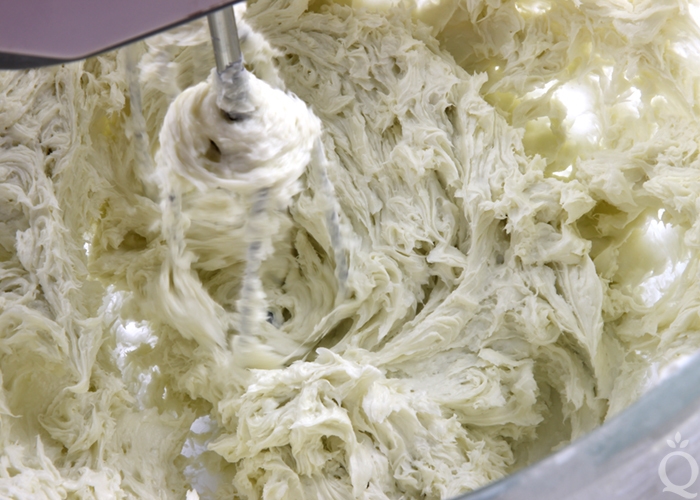 Once the butter is whipped and allowed to sit overnight, it will stiffen to a mousse-like consistency. 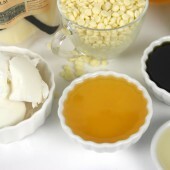 If you prefer a softer texture, you can increase the liquid oil. 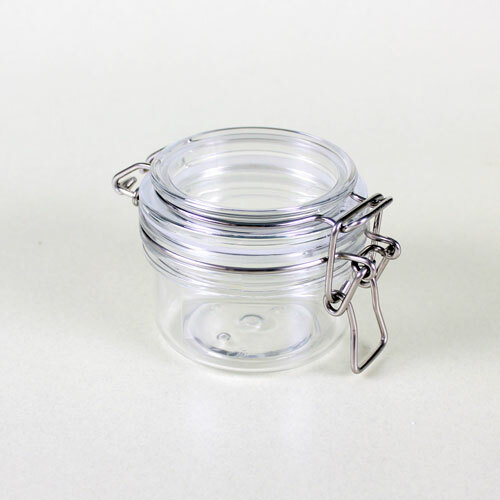 It also helps to put the butter into an airtight container to retain moisture. 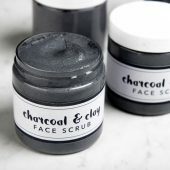 Would this make a good facial moisturizer? It depends on your skin type. 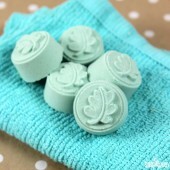 It’s a fairly heavy and moisturizing butter, so if you have dry skin it may work well for you. 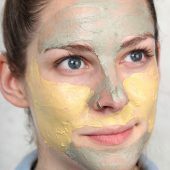 If you have oily skin, it may be a bit too heavy. I would recommend making a small test batch to give it a try. what is the shelf life of this recipe? This butter lasts about a year. It stores best in a cool, dry place. Awsome, what’s the pH on this formulation? 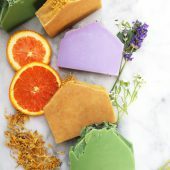 This butter doesn’t have a pH level – the shea butter and matcha green tea butter are essentially neutral, so they’re nice and gentle on the skin. 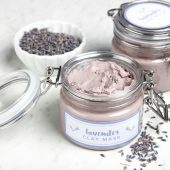 May be a stupid question, but is this body butter used after shower? 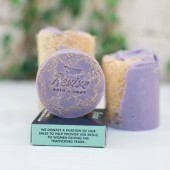 Or to be rinsed off in shower? 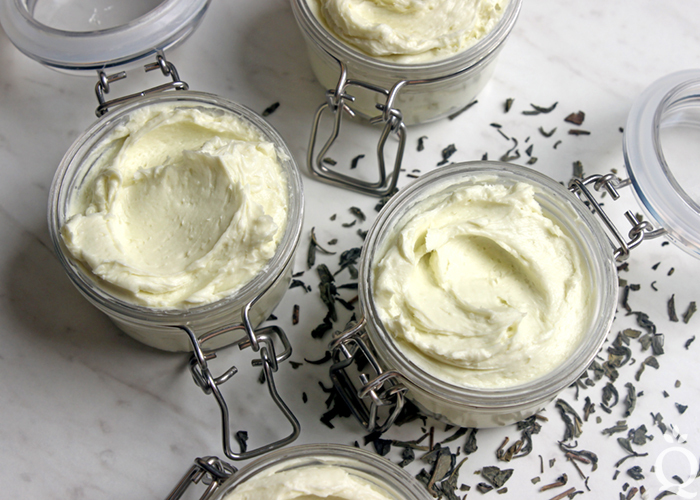 Body butters are great for after the shower because they help moisturize the skin. I’m not sure how it would work as an in-shower moisturizer, but you can give it a try and see what you think. 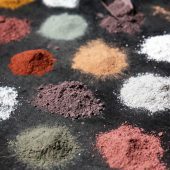 What can i replace the arrowroot powder with? 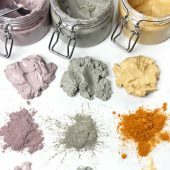 Kaolin clay? 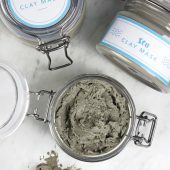 Kaolin clay would be a good substitute. 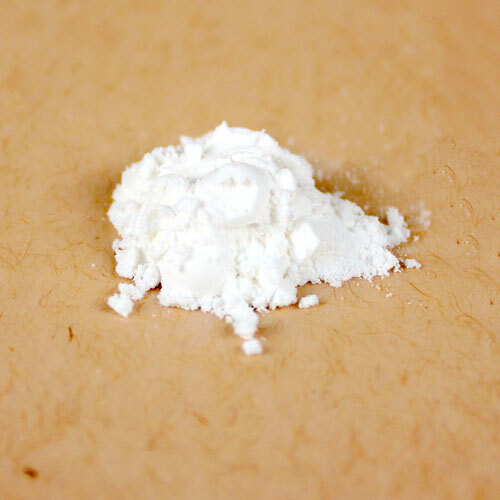 It’s slightly heavier, so I would recommend starting with about 1/2 ounce and seeing how you like the texture. Then keep adding the clay until you get a texture you like. 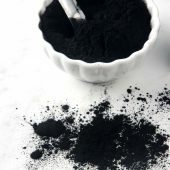 Would tapioca powder also work? If I replaced it, would I use the same amounts? 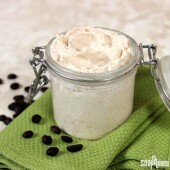 Yes, you can use Tapioca Powder instead of the Arrowroot Powder to help cut the grease in this body butter recipe. You can start by using it at the same amount. 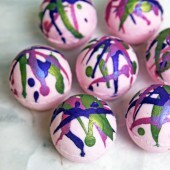 Do you have any advice on coloring body butter? 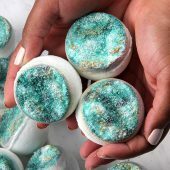 I’ve used mica before, and thought it was okay, but a friend who I gifted a body butter to said she noticed a slight shimmer on her skin when she was at work. She likes it, but I don’t always want my body butters to be shimmery. 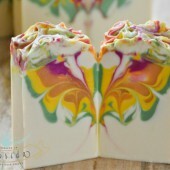 When I try to research the best colorant for body butters, I can’t find anything. Sometimes butters and lotions are mentioned as an afterthought, but not enough for me to trust it. 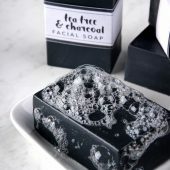 Most of the time, it’s all about soap. 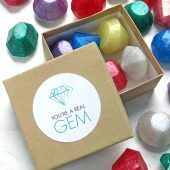 I want to be sure that it will be safe, non staining, and will stay put in the formula, as I plan on giving them as gifts. 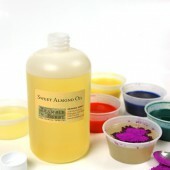 Micas are a good option for coloring butters because they’re lightweight and mix in well. 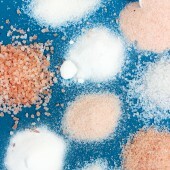 However, if too much is used they will transfer to the skin. 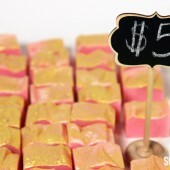 The key is to use a very small amount of mica – just enough to color the butter but not transfer. I would recommend starting out with 1/8th tsp. per pound. Keep adding and testing on your skin until you find that perfect balance. 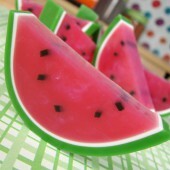 I love to try this project!!! 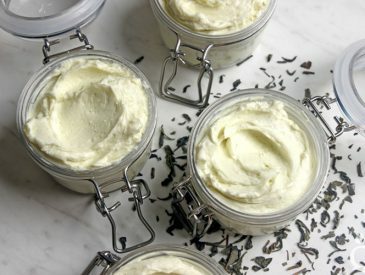 Can I use jojoba butter instead shea butter? We haven’t worked with jojoba butter a lot so I’m not entirely sure. I would recommend making a small test batch to see if you like the consistency with the substitution. Hello Kersley! 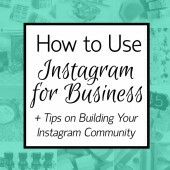 Its a pleasure reading your blog as theres so much more knowledge to gain here. Thank you! 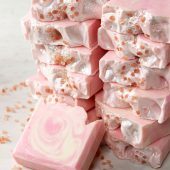 Its helped me alot to get my basic data on soap making and other range of ingredients that are an amazing remedy towards skin health. Does bramble berry deliver their products to indiA? Is there a ‘cure’ time per se? In other words, how soon can it be sold once it’s made and placed in jars? 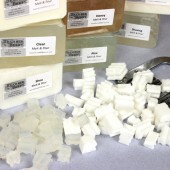 Can Beeswax or Soywax be added to this to make it more stable for the hot summer months for fairs and shipping? And, how much?? Thank you. You can give that a try to make the butter a bit firmer. 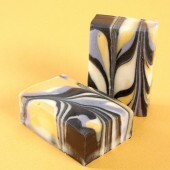 Beeswax has a fairly high melting point so that would be a good one to try. I would recommend starting with 1 ounce and going from there. 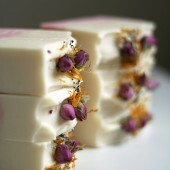 Would you replace something with beeswax or just add an ounce? 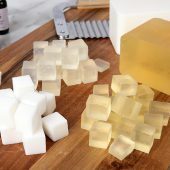 The beeswax is in addition to the current recipe, it’s not replacing anything. You can melt it, whip into the butter, and test it to see what you think. If you want it more firm, you can add more from there. 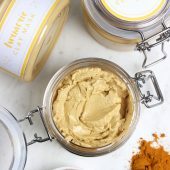 I have matcha green tea powder but not the butter, how would I incorporate it in this recipe? 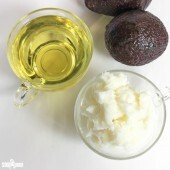 Do you have other butters on hand, like shea or avocado? This sounds like a great project! 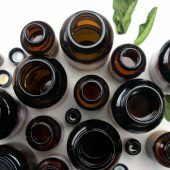 Could I substitute essential oil for the fragrance oil? 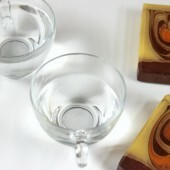 Or if I simply omit the fragrance oil, would that change the texture of the final product? 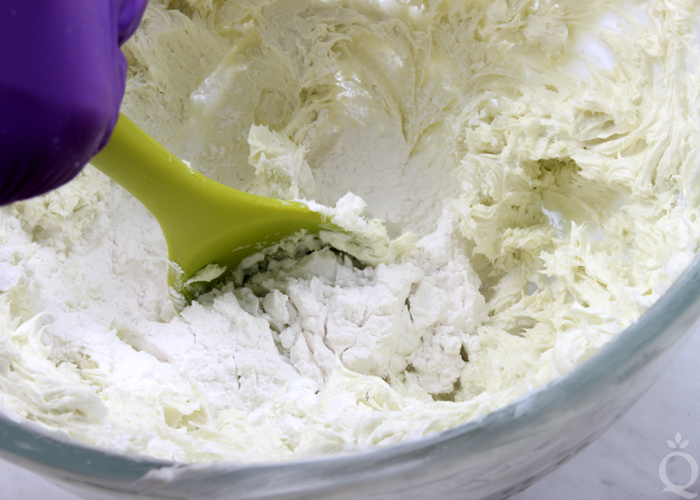 The arrowroot powder helps absorb some of the greasy feeling from the butters. You can skip it if you like, or add tapioca flour. That can usually be found in your local grocery store or online.